"Murray's lucid meditations and living-in-the-moment attitude--e.g., providing simple pleasures like a favorite food to a sick child--serve as useful reminders to all of us that life is precious and fleeting and must be enjoyed to the fullest. It's a simple message but an important one. As much a eulogy to Chan as a testament to the joy of life, the book is a heartwarming tale of dealing with life-altering loss...A tender, love-filled story of how one woman dealt with the loss of a young child." "A compassionate journey in grief and recovery...The memoir is the transcendence from the grief that soon finds this joyful young family." "Catharine H. Murray's middle son, Chan, was diagnosed with a rare and complicated form of leukemia at the heartbreaking age of five. After Western medicine did all it could do, Catharine, her husband, and her three boys moved to a remote cabin in Thailand where Chan spent his final months. Today we're talking about her book Now You See the Sky, a beautiful memoir that recounts the devastating reality of the loss of her child...and how death asked her to 'nail her feet to the floor' to stay present throughout." "Now You See the Sky is so real, so tender and so painful that its impact will be felt long after the last page...It must have been very difficult for Murray to tell this story, so personal yet so necessary, but she writes with such honesty and clarity, sure to evoke strong reader reactions." "A gorgeously written memoir that burrows deep into the heart." "Now You See the Sky is singular--as wise, beautiful, and elegiac as it is specific and in-the-moment. It's a rare memoir in that it gives the impression that time can be stopped. There are images in here, gestures of love, and its hard conversations, that a reader will remember forever." "Powerful More than an intimate and heartbreaking story of parenting a child with leukemia, Now You See the Sky is a lesson in accepting the raw uncertainties of life. Murray gives the reader the gift of her hard-won fortitude and compassion to carry as our own." "Now You See the Sky might be set in Thailand but even after only a few pages this gorgeous debut memoir is located firmly in the reader's heart. I thank and applaud Catharine H. Murray for the openness, honesty, and beauty with which she tells this ungilded story of a mother's love for a dying child. An essential recommendation for those living with loss." 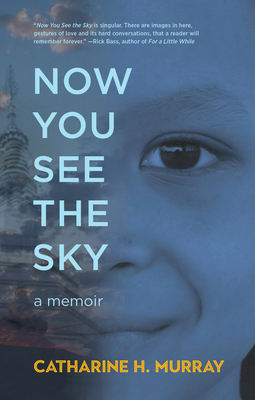 Now You See the Sky is a memoir about love, motherhood, and loss. When Catharine H. Murray travels to a small town on the banks of the Mekong River to work at a refugee camp, she falls in love and marries a local man with whom she has three sons. When their middle son is diagnosed with cancer at age five, their pursuit of a cure takes them from Thailand to Seattle, before they eventually return to Thailand, settling on a remote mountaintop. Full of honesty and grace, Now You See the Sky--the debut selection in Ann Hood's new Gracie Belle imprint--allows the reader to witness the fathomless loss of a beloved child and learn how tragedy can transform us, expand our vision, and make us more fully alive.